It can be a struggle to think of appropriate Christmas gifts for our friends and family. There are only so many gift-sets that can be useful! If you are looking for the perfect gift that is highly coveted, stylish and very much appreciated, then the Kingsmills Hotel has the answer. Our gift vouchers will allow you to tick off your Christmas list for your nearest and dearest, and even the school teacher! Vouchers are available for afternoon tea in the sumptuous surroundings of the Kingsmills Lounge; an elegant treat. Or a voucher for a delicious lunch in the highly-acclaimed Conservatory restaurant will make sure you’re on next year’s Christmas list. We could all be better at making time to treat ourselves to a rejuvenating massage or facial, but somehow life is just too busy! So if you are looking for a gift that has a little extra “care” attached then a voucher for our indulgent and relaxing spa would be perfect. We also offer treatments for men using our award winning Comfort Zone products (and let’s face it – after socks and after shave, it’s a struggle!). 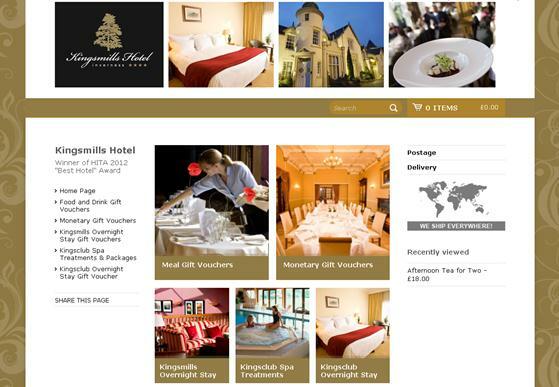 And for that extra special gift we have vouchers for a luxury stay at the Kingsmills Hotel. Purchase a voucher for a memorable visit and choose from our classic, deluxe, luxury, cocoon or retreat rooms. Ranging from the traditional and relaxing to the stylish and luxurious, each room type offers a wonderful experience. To find our more about our vouchers please click here.